Professor Brown’s Commentary is an important scholarly achievement. I really cannot say enough about it. The scholarship is extremely good, the prose is as clear as can be, the passion is appropriately Christ-focused, humble, and pious, and the confident working of so many sources, scriptures, and sayings is superb. I learned a lot from it, and that learning took place on multiple levels. The book worked for me on a practical, exegetical, theological, hermeneutical, and dialogical level, and not in a sequential order but all at once, so on one page and sometimes in a single paragraph I had to try to occupy all of these levels simultaneously. Mormon commentary on the Bible is more complicated, at least potentially, than traditional commentary, because Mormons have added layers of scripture to take into account, and Brown handled these levels of intertextuality with grace and expertise. On a practical level, this commentary is spiritually enriching and would be a helpful guide for any Christian seeking a closer walk with the one who is the subject of Luke’s testimony. Exegetically and theologically, the book abounds in creative, original, and fascinating readings of passages that have been subjected to so much commentary over the centuries that one might have despaired of ever finding something new. Hermeneutically, I found myself in new territory with just enough familiar features to make me feel at home, so that I had to try to understand Prof. Brown’s theoretical commitments even as I wrestled with his understanding of the text. The book requires a hermeneutics of the hermeneutics, we could say. The test of any commentary is how well it makes old words seem young again, and how it illuminates the obscure by drawing overlooked connections while deepening the historical reality from which those words emerge. On that score Prof. Brown’s book is a virtuoso performance. His commentary is also what I would call a common sense reading of the text, though deeply informed by a lifetime of study of the ancient languages and history. For sociological reasons, it is very hard to find this kind of commentary in Catholic and Protestant circles these days. So much modern scholarship begins with doubt about the credibility of witnesses, dismissal of God’s direct involvement in history, and what is probably worse of all, an unearned sense of moral superiority over our forefathers. The result is a painfully speculative tendency to try to find the story beneath the story. The Latter-day Saints have a unique perspective to bring to the commentary table: their love of the King James, I suspect, makes them less susceptible to the quixotic belief that the authority of the Bible is dependent on access to its most original version; their confidence in the tangible and ongoing reality of God’s verbal communication as the primary form of divine revelation puts them in a good position to appreciate the inspired nature of scripture; and their experience of the living office of a prophet, who leads his people by his words, gives them a unique window onto the socio-cultural dynamics of a world that is alien to too many Christians today. Most of all, their own expansive notion of scripture keeps them on their toes, so to speak, to read between the lines and to put scripture in the larger context of their total theological worldview, giving them a creativity that is lacking in fundamentalist versions of literalism. This is a new kind of literalism, a literalism of the spirit, not the letter. The theological portrait that emerges from Luke in this commentary is unique in how it holds together the human and the divine natures of Jesus, and not just in an abstract way. The humanity of Jesus Brown gives us is refreshingly family-centered, and Jesus’ divinity is dramatically personal. Jesus is of a family first and foremost before he is a priest, prophet and king, to use the traditional language of Jesus’ three-fold office. At the same time, his personality is not solely the product of his earthly experiences. He comes to us as one who is for us and of us before he is even born. I want to comment on two other topics, both of which open up enormous avenues of dialogue between Mormons and Catholics. The first is the sweating of blood at the Mount of Olives, which is an astonishing scene in Luke that does not receive any serious theological reflection outside of Mormonism today. It is clearly the pivotal moment in his assumption of our sin, with his bloody sweat and his need for an angel to give him strength. I suspect that it is the content of this troubling passage that has led so many scholars to go to great lengths to argue it out of the canon. It is too graphic, too real, and portrays Jesus as too ignoble, too frail and weak. I welcome the Mormon confirmation that this event actually happened as Luke portrays it. The second is Jesus’ descent into hell and Brown’s placement of it at the center of Jesus’ ministry. I have never read anyone who emphasizes that Jesus not only preached in hell but began organizing the church there. He organized the righteous to preach in his absence. This is an astounding claim that has no precedence, as far as I know, in traditional theology, and yet it makes absolute theological and exegetical sense. To me, it means that even in hell the church is active in carrying out God’s plan. The Catholic Church believes that salvation comes through the Church, and thus it makes sense that Jesus would not have left the spirits in prison without access to the church. The Mormon explication of the descent thus gives me a new delight in the passage from Matthew 16:18, where Jesus says he will build his church and not even the gates of hell will prevail against it. Wow! I think this book would be beneficial for any and all Christians, regardless of their relationship to Mormonism. Of course, it will be of most interest to Mormons, but it will also appeal to several other kinds of readers. First, there are critics of Mormonism who think that the Saints do not hold the Bible in high (or “high enough”) regard. There has been an explosion of Mormon scholarship on the Book of Mormon, but critics think that such scholarship simply demonstrates how far the Saints are removed from biblical Christianity. So, this book has (and others in the series, presuming there is a series) a great symbolic importance. I can’t emphasize that enough. The very fact that Mormon scholars are producing first-rate work on biblical commentaries will be important for all future Mormon-creedal Christian dialogues. Third, those interested in religious dialogue will find this to be not just informative but actually a new avenue for thinking about how Mormons and creedal/traditional Christians can learn from each other. This series opens up a new forum for dialogue between branches of the Christian tree that are often intent on misunderstanding each other. So far, dialogue between non-Mormon and Mormon Christians has largely focused on what Mormons believe that is different from what more traditional Christians believe. Such discussions inevitably end up in the abstract realm of philosophy and theology. Now, we can dialogue about how Mormons read that might be different from how non-Mormons read the Bible. Reading scripture is a fundamental practice for Christians, one that we all share, and thinking about how Mormons read the Bible will go a long way, I suspect, toward making Mormon commitments to historical Christianity more clear and thus to eliminating some of the theological exoticism that non-Mormons often project onto the Saints. Indeed, I would go so far as to say that it is in exegeting scripture that Mormonism will prove its usefulness to the rest of Christianity. That last point leads to my last potential non-Mormon audience. So, fourth, I think there will be scholars interested in what Mormons can see in the Bible that non-Mormons cannot see. These scholars will not be the typical historians of the Bible set. They will be those who, Mormon or not, are convinced that hermeneutical assumptions guide exegesis. They will find in this volume, therefore, evidence of how that works. 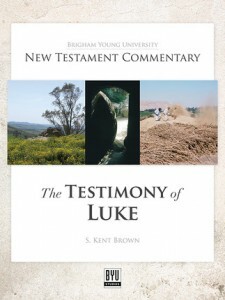 Thus, theologians and scholars working on how the Gospel of Luke is shaped by its “reception history,”—how Luke, like all great texts, is read in and through history and not around it—will find much to learn here. A final thought: Mormon hermeneutics is a relatively new topic of scholarly exploration. This book is not a theory of interpretation. But it opens up the topic of hermeneutics in new and fruitful ways. It is hermeneutics in practice, but now we need more conversations about how Mormons read the Bible, what assumptions they use, how Joseph Smith’s translations function as guides, and how all of that is both similar and different to traditional methods. I truly believe that the scholarly merit of this book, and its creativity, will open up a new era in Mormon studies and the various Mormon dialogues that are not underway around the world. The more I think about this book, the more I excited I get. I can definitely see this book being used in a secular or private school setting where Mormon studies is the topic. Since Mormonism is all about extra-canonical scripture, this book is the first to really show, in a manner that is of the highest scholarly level, just how, precisely, the multiple scriptures of the Mormon tradition enhance, expand, and intensify a faithful reading of the Gospels. That is indeed an exciting prospect. Stephen Webb, PhD University of Chicago, Catholic theologian. Retired Professor of Religion and Philosophy, Wabash College.